We encourage you to spread the word and have all your offices and divisions list on our new directory website (i.e., PRWeek LA, PRWeek NY, etc.) Please note that each username/account can only support a single company listing. If you would like to create additional listings, please create a custom account for each additional company, unique company office location, or division. 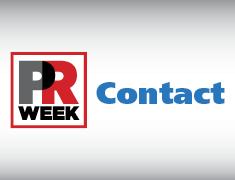 The beauty of PRWeek Contact is that each company listing is tied into our unique, automated lead-gen reporting system. Enjoy, and happy listing!